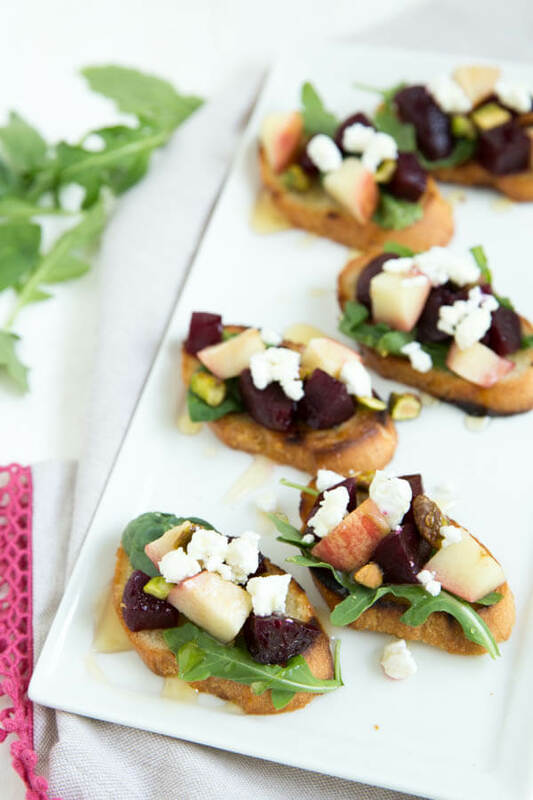 Grilled Apple Beet and Arugula Crostini is a fresh appetizer made with beets, apples, greens, pistachios, goat cheese and a drizzle of honey! Today I’m back with another tasty crostini recipe. 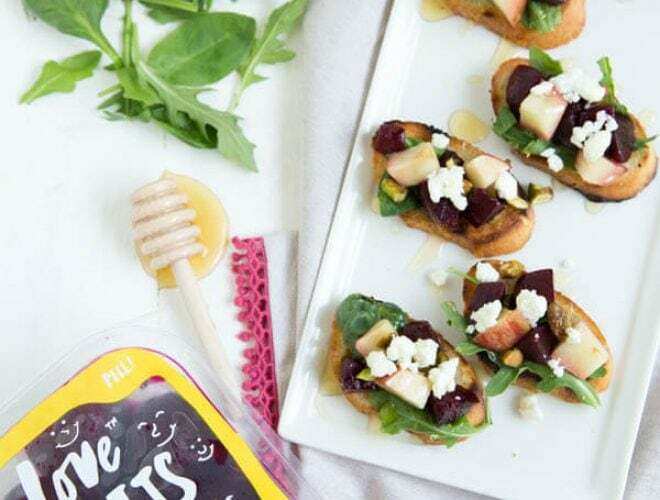 If you are looking for a simple lunch option or an idea for a summer appetizer, then this Grilled Apple, Beet and Arugula Crostini is exactly what you need. 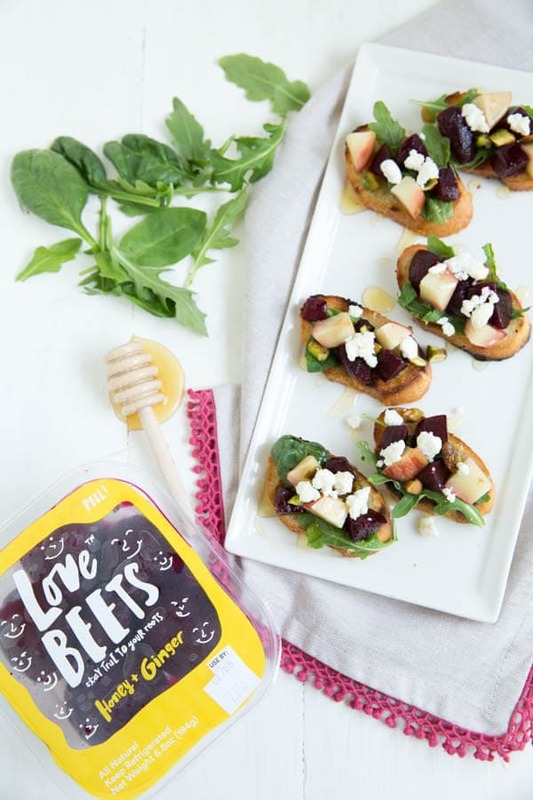 Grilled marinated beets, grilled apples, goat cheese, pistachios and greens are layered over slices of grilled French baguette. 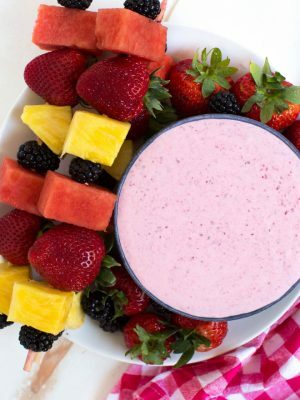 A simple drizzle of honey or pomegranate balsamic dressing completes the flavorful lunch or snack. For this recipe, I used organicgirl baby spinach and arugula blend with Love Beets honey & ginger marinated beets. 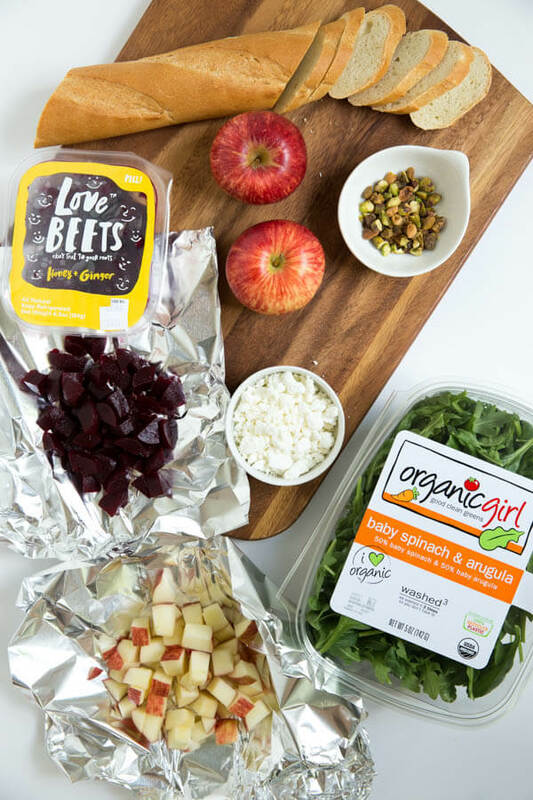 You could use any of the organicgirl salad blends or Love Beets marinated beets. 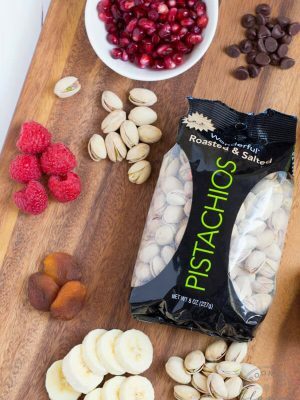 Grill the apples and beets in foil packets until softened. You can also grill the slices of baguette at the same time. 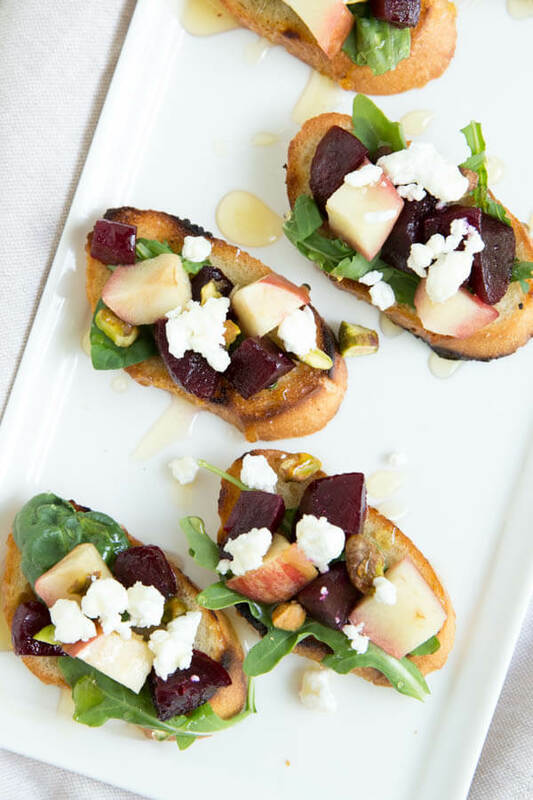 Layer the beets and apples over the slices of bread with goat cheese, chopped pistachios and greens. Within minutes you have an easy, simple and flavorful dish. 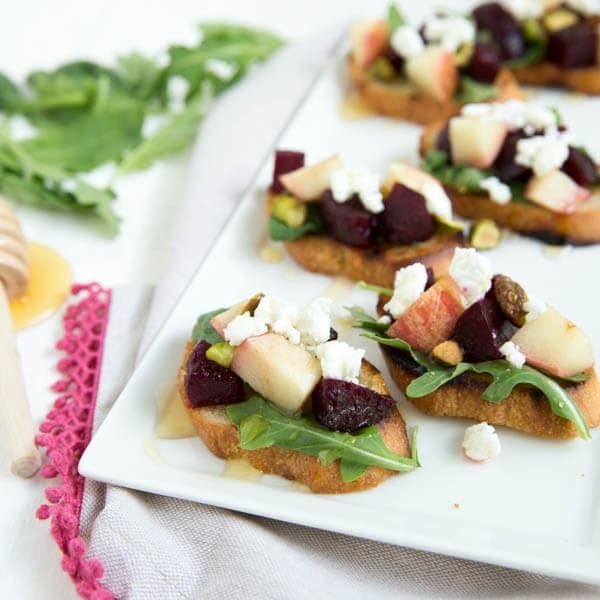 I like to top the crostini with a simple drizzle of honey or organicgirl’s pomegranate balsamic dressing. 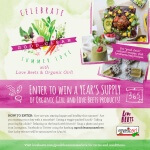 This month I teamed up with organicgirl and love beets for a special #goodcleansummerlove promotion. 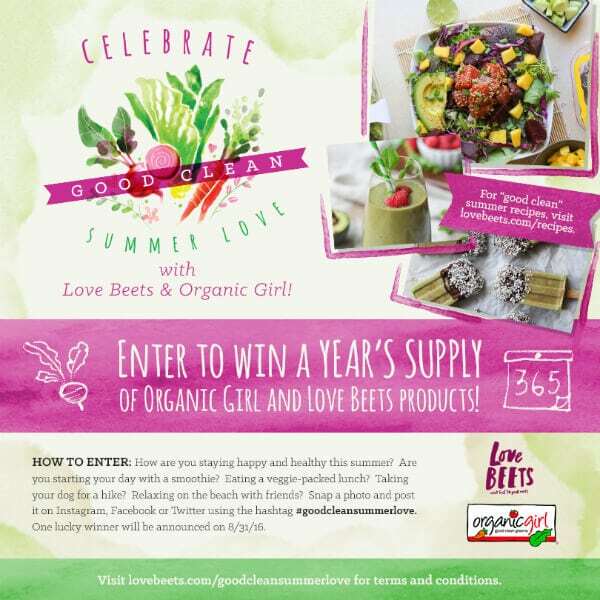 Share your favorite summer photos with the #goodcleansummerlove hashtag for a chance to win a year’s supply of organicgirl and love beets products. But you better hurry because the promotion ends soon! Cut two large pieces of aluminum foil. Place the chopped beets in the middle of one piece of foil and the chopped apples in the middle of the other piece of foil. Drizzle two teaspoons of olive oil, divided evenly between beets and apples. Pull the short sides up and roll them down over each other, then fold over each end to seal and create two packets. Brush both sides of bread slices with remaining olive oil. Place the foil packets on the grill directly over the heat. Grill bread until golden and crisp, about 2 minutes on each side. Grill beets and apples until tender, about 3 minutes on each side. Remove bread and foil packets from the grill. 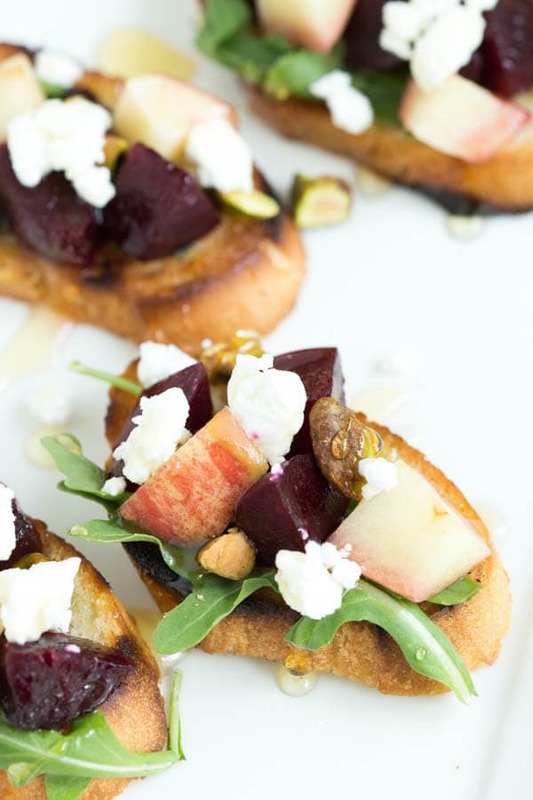 Top bread with grilled beets, grilled apples, greens, goat cheese and pistachios. 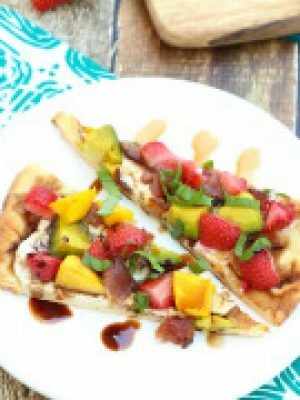 Drizzle with honey or organicgirl pomegranate balsamic dressing. Serve immediately. 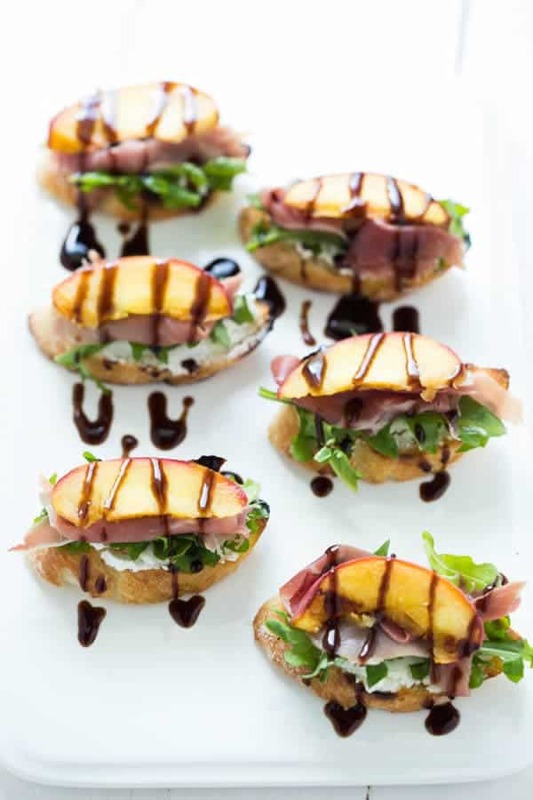 Also try this Grilled Peach Crostini with Arugula, Prosciutto and Goat Cheese!